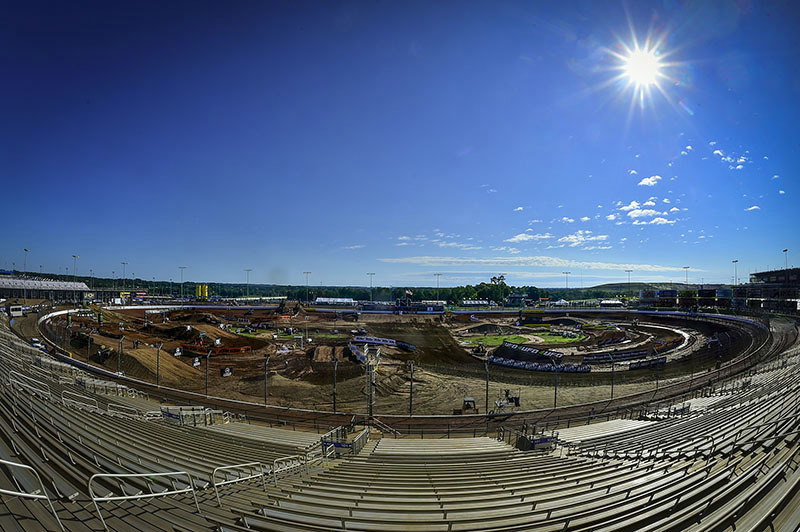 CHARLOTTE (United States of America), 03 September 2016 – The penultimate round of the FIM Motocross World Championship is going to be unreal with the best of America lining up to take on the best of MXGP and MX2 at the impressive Dirt Track at Charlotte Motor Speedway, in Charlotte, North Carolina, America. Honda Gariboldi’s Tim Gajser and Red Bull KTM Factory Racing’s Jeffrey Herlings both have one hand on the gold plate in their respective classes. Both riders are likely to wrap it up this weekend, although it won’t be a walk in the park with the likes of Monster Energy Kawasaki’s Eli Tomac and Auto Trader Monster Energy Yamaha JGRMX’s Justin Barcia adding to the usual suspects Red Bull KTM Factory Racing’s Antonio Cairoli and Monster Energy Yamaha Factory Racing’s Romain Febvre, to name a couple, in the MXGP class, while Herlings’ is likely to have his hands full with Yamalube Star Racing Yamaha’s North Carolina native Cooper Webb and Monster Energy Kawasaki’s duo of Adam Cianciarulo and Austin Forkner. Because Herlings is on the cusp of claiming his third FIM MX2 World Championship title, highly acclaimed Dutch television networks NOS and Omroep Brabant will be following the Monster Energy MXGP of America’s closely so that they can provide the Dutch fans with some feature footage celebrating his victory. As for the US fans who are eager to see how the Americans with fair against the Europeans, you can watch the Monster Energy MXGP of America’s on CBS Sports Network. Check the guides below to find out where you can watch the MXGP of America’s, otherwise, tune into www.mxgp-tv.com where you can SAVE 70% on a season pass, which will give you access to watch both days of the FIM Motocross World Championships and the European Championships, LIVE and OnDemand. It will also allow you to watch the Monster Energy FIM Motocross of Nations and the Monster Energy SMX Riders’ cup LIVE. Don’t miss any motocross action this year! Sign up to www.mxgp-tv.com today. Due to the change in timetable, there will be no qualifying races today, only Free Practice and Timed Practice, and then straight into the main events. The Timed Practice sessions will be LIVE on www.mxgp-tv.com at 14:30 and 15:15 EST. MXGP will be available across the board in high definition and is also globally available to view live and in HD on MXGP-TV.com. Click here for the complete list of countries and cooperating MXGP broadcasting networks. Saturday: MX2 Free Practice 13:30; MXGP Free Practice 14:05; MX2 Time Practice 14:40; MXGP Time Practice 15:25, MX2 Race 1 17:15; MXGP Race 1 18:15; MX2 Race 2 20:10; MXGP Race 2 21:10.